Description: Abe's Motel & Fly Shop Inc is a business categorized under hotels & motels, which is part of the larger category hotels & motels. Abe's Motel & Fly Shop Inc is located at the address 1791 Highway 173 in Navajo Dam, New Mexico 87419-9712. The Owner is Tim Chavez who can be contacted at (505)632-2194. 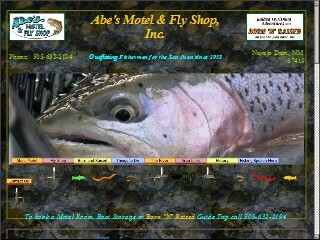 Location & access map for "Abe's Motel & Fly Shop Inc"